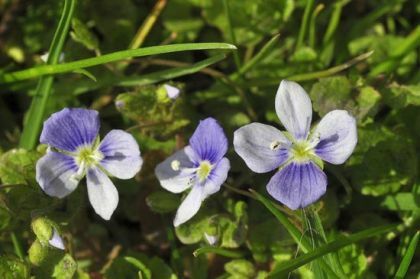 On lawns, pastures and in short grass, this perennial wildflower forms prostrate mats of leaves and flowers, spreading on creeping, downy stems. 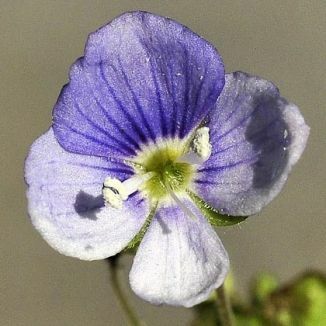 It bears bright blue four-lobed flowers (8–12 mm) on long slender stalks which arise from the leaf axils. They bloom from April to July. The toothed leaves are round and kidney-shaped and on the flowering stems they are alternate while, on the non-flowering, they are opposite. This is not a native plant and it belongs to the Plantaginaceae family. I first recorded this wildflower near Ballitore, County Kildare in May 2010 when I also photographed it. I am grateful to Dr Declan Doogue, BSBI Vice-county Recorder for County Kildare, for confirming my identification. Originally native to the Caucasus, Veronica filiformis has become naturalised in Northern Europe. It spreads rapidly whenever it is cut as fragments can regenerate easily. Lying close to the ground, it is quite happy to have a close shave from the lawn-mower.